If you are looking for a helmet that will match the styling of your retro bike, look no further. 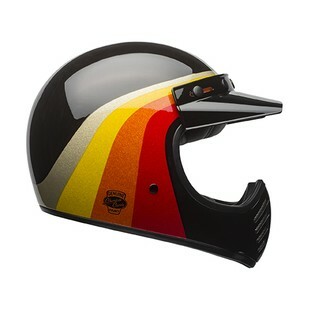 The new Bell Moto-3 Chemical Candy Helmet brings back memories of late 80's IMSA race cars and old school dirt bikes. Despite this helmets old school charm, it uses the latest technology to help you protect your valuable noggin. As one of the most premium vintage-inspired lids on the market, the Bell Moto-3 Chemical Candy Helmet is a top-tier selection for riders looking for classic style, and contemporary motorcycle helmet amenities. If you have been holding onto your 20-year-old helmet because you liked the look, the time to upgrade has never been better.